Configuring your GMX’s SMTP server for an email application or client (Microsoft Outlook, SendBlaster, Mozilla Thunderbird etc.) 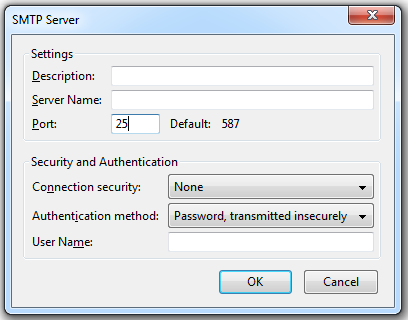 is very easy: you simply need to enter the SMTP settings in its server configuration window. Now you’re ready to send and deliver your messages. Anyhow, if you plan to send mass emails (for instance if you are putting up a newsletter campaign), you should definitely opt for a professional SMTP service. In fact, a free outbound service like GMX’s SMTP server both puts a limit to the number of people you can send the same email to (in order to deter spammers), and can’t guarantee a good deliverability for your emails. So in order to maximize your delivery rate and make sure that all your messages get to the inbox, the best choice is to rely on a dedicated outgoing server like turboSMTP.